More like rich and spicy, I suppose. Quite a production for delivering lunch boxes. Though it isn’t nearly as intricate as their computer and phone wiring system. A surefire way to insure an uncomfortable night’s sleep on the couch. The first note is discovered. The premise and story structure is established. We forget things when we have no one to tell them to. A poignant truth. Is this why old people always insist on regaling the glories of yesteryear? Empty lunchbox prompts a heartfelt note. Touching scene. 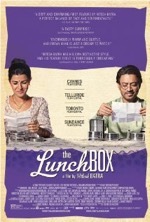 Final analysis: a touching tale of unrequited love brilliantly portrayed by Khan and Kaur. Rating: 3 out of 4 stars. Moral: Sometimes the wrong train leads to the right station. All aboard! Though the premise is simple and the story is straightforward, there’s an emotional depth to this movie that far transcends its status as a drama/romance hybrid. The film features real people in real situations and their actions and reactions are wholly believable all the way through to the existential ending. The movie is preoccupied with two of life’s greatest necessities and pleasures…love and food (and how the two often intersect). The visuals of food preparation and consumption, aided in no small part by mouthwatering descriptions of aromas and flavors, produce an almost Pavlovian reaction in the viewer. It’s recommended that you watch the movie on a full stomach—otherwise you might leave the theater with nubs where your fingers used to be. The location work is wholly immersive and makes you feel like you’ve taken a two hour vacation to Mumbai. And, all things considered, this isn’t a bad way to spend two hours. Just don’t be surprised if you’re craving Indian cuisine for the next week. Chris Berman’s opening narration certainly generates excitement over what’s to come later in the film. His presence also legitimizes the movie and lends the fictional story some semblance of a “real” NFL draft. The Browns are a desperate team? Not exactly a news flash. However, I do applaud writers Rothman and Joseph for their decision to cast the spotlight on one of the most downtrodden franchises in professional sports (and for making the Seahawks organization look like a bunch of money-grubbing schmucks…no love lost here). Somewhere in the movie, someone mentions changing the look of the Browns’ helmets. I hope I wasn’t the only one who agreed with such a sentiment. Is there a plainer, uglier helmet in the NFL? A deal over pancakes. Costner isn’t hungry. “People pay to get splashed.” A powerful commentary on the state of the game. Frank Langella is such a great actor who brings gravitas to every role he plays. He makes Costner seem like a whimpering child in this scene. Lots of split screens. A bit much? The film employs more split screen scenes than an episode of 24. It’s a useful device for showing two sides of a phone conversation—and there are a lot of them in the film—but by the middle of the movie this stylistic choice reaches overkill status. I will say that Reitman cleverly shows one person’s shoulder jutting into the image of the other person’s image panel, etc, and the scene where an individual travels from one edge of the screen to the other, passing right over the other person talking on the phone, was absolutely brilliant. This critique comes from his screen mom, Ellen Burstyn. Montana spots John Candy in the stands at the 1989 Super Bowl. Wonderful anecdote and scene. I’d never heard this story before and it really enriches the text and subtext of this scene. Is that your final answer, Callahan? Sorry Bo, the Browns already have a “super” quarterback. If the emphasized word is too cryptic…Tom Welling from TVs Smallville. Final analysis: an educational, if fictional, behind-the-scenes look at the NFL draft. Not as lightweight as some of Reitman’s earlier efforts, but not as engrossing as it should’ve been either. Rating: 2 1/2 out of 4 stars. An original gridiron tale that should tide over diehard fans until the new season. 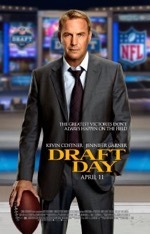 If Costner keeps on this career track, he’ll soon be the king of sports movies. How many has he made anyway? Bottom line, this is a decent film that effectively reveals the back room wheeling and dealing that accompanies an NFL draft. 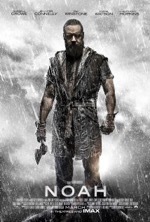 As exciting as that sounds the film is often devoid of excitement, owing largely to the fact that the character moments feel perfunctory and insipid. The blossoming relationship between Costner and Garner, the pressure Langella places on Costner and the family friction that results from the recent death of Costner’s dad all play out like vignettes in a Lifetime movie. Although it captures the flavor of an NFL draft, the movie is a pale reflection of the exhilarating, pulse-pounding drama that takes place during an actual draft. As such, some will choose to forego this film and just wait another month for the real thing. The opening matte paintings have a Mr. Rogers charm. Something about the way the little tram moves up the model reminds me of the cheesy miniature sets seen on Mister Rogers’ Neighborhood on PBS. Law dines with Abraham, who regales the story of the early days of the hotel. Which, along with some minor crosscutting back to the present, constitutes the bulk of the film. The Green Goblin lands the final blow…of course. Elaborate breakout sequence is amusing. I don’t think it’s possible to devise a more indirect route for escaping a prison. And once free, everyone would stand around and talk for a few minutes, right? Hilarious! A second copy of the second will...quite the confession. Old style filming on the ski chase is hilarious. The increased film speed has a silent era feel akin to the Keystone Cops movies. 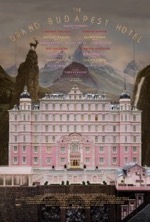 Final analysis: not as endearing as Moonrise Kingdom, but a fine effort in its own right. Rating: 3 out of 4 stars. A zany tale with a fine lead performance by Fiennes. Enjoyably outlandish, this movie is vintage Anderson. It has all of the hallmarks that have come to define the auteur’s style: quirky characters, decorated ensemble, ornate dialog, stylish camerawork, lavish locations and high production values. Though a million miles apart thematically, this film actually boasts a narrative structure similar to the one employed in Christopher Nolan’s Inception (2010). Just as Nolan’s preeminent mind-trip featured a plot with multiple layers, this movie also follows different sets of characters (real and fictitious) through different periods of time. The film’s denouement seamlessly progresses forward through the levels until we’re back in the present, which is where the film began. It’s a clever framing device, brilliantly conceived and executed by Anderson and co-writer Hugo Guinness. Bottom line, if you’re in the mood for something outside the box, this film should do rather nicely. That kind of speed, and endurance, would definitely come in handy at times. Triskelion equals S.H.I.E.L.D. headquarters. Also a planet in the original Star Trek. “The Gamesters of Triskelion” is the title. A largely forgettable second season show save for Angelique Pettyjohn’s tinfoil bikini. Capt. America argues with Fury over freedom vs. fear. This is a very incisive, and topical, discussion…a rarity among superhero movies. The Sundance Kid moderates the Jedi council. I kept looking for Yoda among the holograms. Fury’s SUV gets a police sandwich. I want to know the make and model of Fury’s vehicle, because it sure takes a pounding…yet keeps tearing down the street. The elevator’s getting a little full. The Winter Soldier’s rifle really packs a punch. One of the coolest visuals in the movie. “I am so fired!” Stan Lee sighting. His brief cameos just keep getting better with each successive Marvel movie. Eat your heart out, Hitchcock. “Captain’s orders.” Let the civil war begin. ...that doesn’t allow the action scenes to run away with the movie. 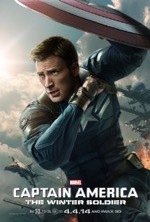 A marked improvement over the first film, The Winter Soldier features a taut plot, a rather ingenious conspiracy and a terribly mysterious antagonist, who, much more than a mere caricature of a villain, actually strikes fear into the heart…there are several moments when it looks like our hero might be defeated by the shrouded assailant. However, when the villain’s secret identity is finally revealed, it’s a bit of a letdown...comic junkies (who know far more about the character’s back story than I do) will have a different opinion, I’m sure. The movie is salient in the way it wrestles with the realities of the postmodern world, such as: corporate corruption, terrorism and rampant surveillance. This film is more down-to-earth than most of the other superhero movies released over the past decade, but it looses its artistic edge by trying to be too realistic. A main contributor to this is the utter lack of anything “super” in the movie. Most of the technology on display in the film isn’t that much more advanced than what governmental agencies use today. Also, and more significantly, the entire film takes place in D.C.—no globetrotting, no exotic locales and no extraterrestrial environments in this movie. Some would argue that the everyday nature of the story is what makes it compelling, and I can’t argue with that. However, the look and feel of the movie is essentially an episode of Heroes with a blockbuster budget. Despite the solid story and serviceable performances, there isn’t much to marvel at here. Opening narration effectively sets up the particulars of this dystopian world. It’s a CliffsNotes version in case you haven’t read the book. Clever use of mirrors in the choosing ceremony. A nice embellishment to the book. Director Neil Burger maximizes the mirror motif, which is a very keen choice since such reflective surfaces are considered the height of vanity by those belonging to the Abnegation nation. Guess I’d be factionless in this world...I could never cut my hand with a knife. Just watching others slice into their own flesh makes me faint. Can you tell I’d never hack it in Dauntless? Who will be the first to jump into the black hole? “What makes you think you can talk to me?” Snap! Tris gets off a nice retort, though. Mosh pit initiation is fitting for Dauntless. Crowd surfing in a cafeteria seems wholly appropriate for this faction. Can’t see it happening at Hogwarts though. First jumper versus last jumper to fight in the ring. Short bought. Training tips from Four followed by a brutal cliffhanger. Jai Courtney (A Good Day to Die Hard) was the perfect casting decision for Eric, the movie’s loathsome antagonist. Neuro stim darts. Very cool. Let the games begin. “Pull the break!” What a rush that would be. Attack of the crows...didn’t we already see this in a Hitchcock movie? Entering someone else’s fear landscape...double the terror. 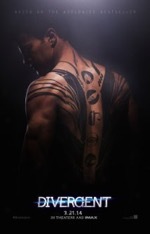 Four shows off his tats during his tryst with Tris. Does a scene get any more gratuitous than this? Still, we’ve gotta’ give all the teenage girls what they paid for, right? Let the drone war begin. Not clone war, because we’ve already had one of those in a galaxy far, far away. “A beauty we can’t afford.” Socialism at its finest, folks. Nice twist with Winslet. Different than the book. Clever resolution. Final analysis: faithful to the book with minor additions/deletions. A twist on Brave New World and The Hunger Games, Divergent is a cautionary tale about a society gone wrong. However well-intentioned the formation of the factions was, none of them (except for Amity because, by golly, they just don’t know any better) are currently operating within the parameters of their proposed purpose. Dauntless have become too brutal, Erudite too manipulative, Candor too honest and Abnegation too powerful. The original intention for the expressed function of each faction has been taken to an unhealthy extreme. Just goes to prove that no matter how altruistic a societal structure or governing system is when it’s established, people will always find a way to frack it up. Pardon my Galactican. Rating: 3 out of 4 stars. A decent dystopian yarn with adequate action and suspense. Next up: Insurgent. The similarly themed The Hunger Games series was the exception to the rule that says you can’t do a point by point narrative reconstruction when adapting a book to the big screen. Adhering to the written page served those movies extremely well, with kudos going to Suzanne Collins for the strength of her source material. Divergent, to its own detriment, is the rule rather than the exception. Though there are minor alterations between book and movie, and despite the fact that the book series was written readymade for a big screen trilogy, the book didn’t translate as well to the film in this instance. Perhaps it’s that too much screen time is spent on Dauntless training and testing (and that too much time is spent in Dauntless territory). Perhaps the military overthrow and subsequent containment of the coup seems far too sudden and too cause and effect in its treatment. Perhaps the deaths of Will, mom and dad all come too quickly in succession for believability and for maximum impact. I mean, at least Luke had appropriate breathers in between the deaths of his aunt and uncle, Ben and Biggs in Star Wars. Perhaps it all boils down to the tried and true adage that the book is always better than the movie. Whatever the reason, here’s hoping the sequel will do a better job of visualizing Roth’s words onscreen. As is, the movie is a diverting tween-centric, near future thrill ride. However, it could’ve been, like its hero, a unique force of nature.